My son has a Kawasaki jet sky and he has been bugging me with the possibility of carrying it in Rainha Jannota. Is there a simple system to set that thing in the transom? I don’t think my swim platform has structure to support 750 lbs which is the weight of his jet. I have told him I would tow that think, he claims that towing is dangerous if the water inlet for the jet is not properly plugged. Have any of you guys dealt with this issue? How did you do it? there are more similar articles also in that search topic. From this picture it can be done, I would be sure to lock it well at night it would make a good prize for a thief! good luck! 1000 lbs is small for a tiny crane , or a fine set of davits. I prefer the davits as the unit can be lifted every night. Do all your neighbors a favor and leave the damn thing home. Thank god they are banned up here in the San Juan Islands. In Brazil the authorities had put all barriers in these things, including forbidding the traffic of them in mooring areas. He uses the damn thing to do volunteer work on weekends with a foundation that monitors trash in the sea as well as sewer. Good, but my boat has nothing to do with this. 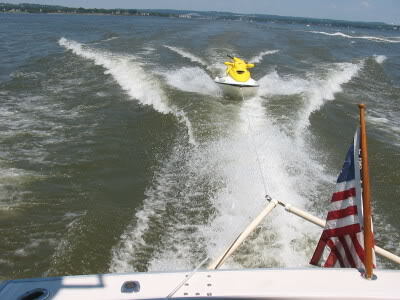 I was on board my nephews runabout while he was towing his PWC when it hit a wave. The whole thing submarined - went completely under. I have no idea if it was attached at a proper tow point, or if anything was being done incorrectly; that was 20 years ago. I'll show this thread to my son....water bikes my behind! I know a guy that uses his crane to put one up on his boat deck, same model boat as mine. If we ever move the boat south we'll put a couple up there. I have a pair of seadoos we keep at our dock at the house and the admrial and I love to go scoot around on them. Remember too these toys are designed to be day sailed, stored dry. Keeping all that interesting metal in sea water , where marine growth occurs is probably not conducive to live long and prosper.